Clump-forming tuberous perennial with irregularly lobed leaves and deep blue, daisylke, flowers. A. blanda'Violet Star' Violet-coloured fl owers. 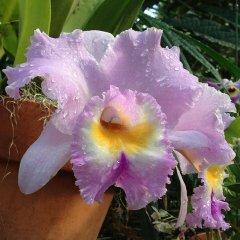 A. blanda'Blue Mist' Pale blue flowers. 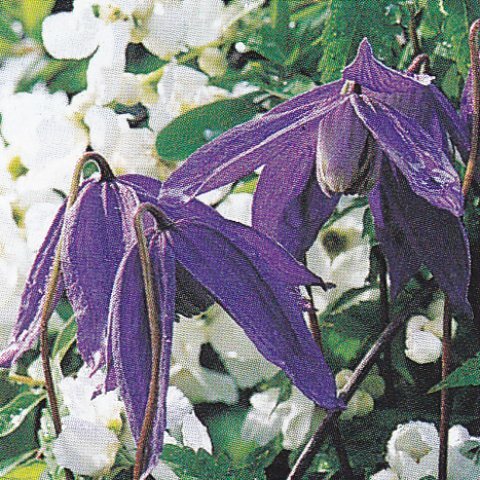 Robust and free-flowering deciduous climber bearing pendent, four-petalled deep blue flowers with cream anthers. The flowers are followed by fluffy seed heads. the tendrils to cling to. Prune lightly after flowering until the plant outgrows its space or becomes straggly. Then it can be cut back hard. 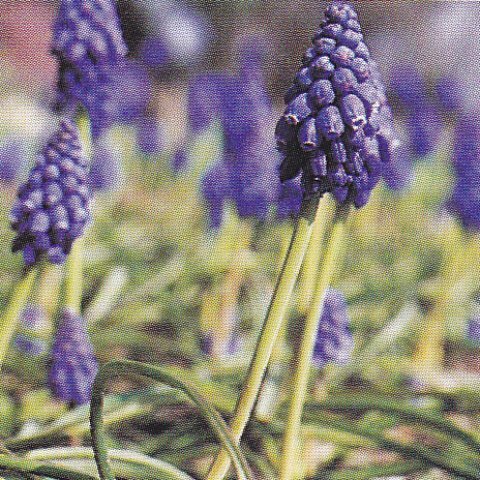 This early spring flowering corm produces large, rounded, rich purple flowers with orange stamens. C. vernus 'Purpureus Grandiflorus' Intense violet flowers; very free-flowering. Cultivation: Plant in autumn in John Innes No.2 with extra grit. Place corms very close together at a depth of 7.5cm. Site in sun or shade. Keep the compost moist but avoid waterlogging. Mice and voles eat newly planted crocus corms. Bulb producing erect spikes of up to 40 bell-shaped, very fragrant flowers. H. orientalis 'Ostara' Violet-blue flowers. Cultivation: Plant in auturnn 10cm deep in John Innes No.2. 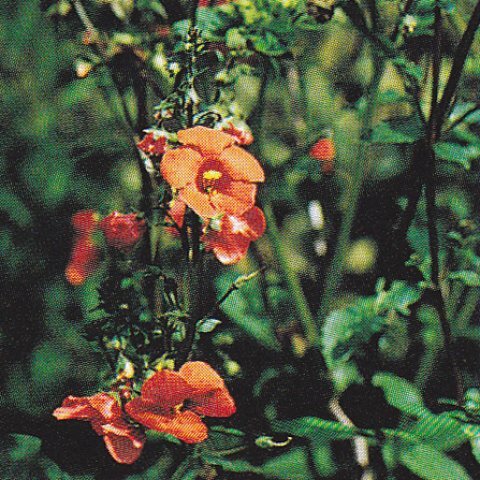 Position in sun or partial shade and water moderately while growing, but avoid excessive winter wet. Hyacinth bulbs are best discarded after one season and bought fresh each autumn as the second year's flowering is usually poor. Prone to various rots and moulds. 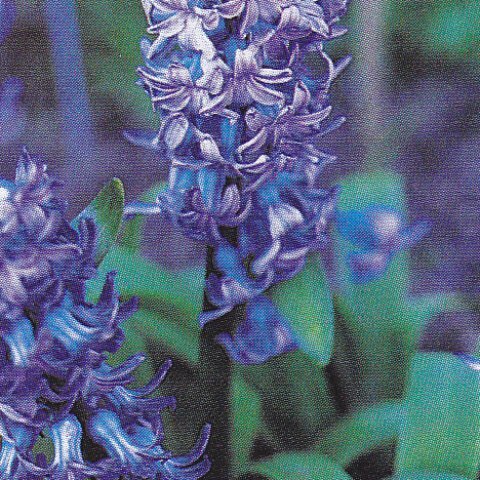 Bulb producing dense, erect spikes of tiny, bright blue flowers. The linear leaves appear before the flowers the preceding autumn. M. armeniacum 'Blue Spike' The tiny bell-like flowers are double. M. azureum Has pale blue flowers. No.3. Site in sun or partial shade. Water freely in summer and less in winter. Feed monthly in the growing season. Provide some support for the scrambling stems. Prune out about a third of the shoots in spring.